Marianna Stoltz House Bed and Breakfast is a historic landmark example of Victorian era craftsmanship. Situated in the tree-lined central district of Spokane, it allows close proximity to the cultural core of the downtown area including the Opera House, the Convention Center, the Centennial Trail (jogging & bicycling), and Gonzaga University. Enjoy the wide, wrap-around veranda and spacious stately common rooms (including parlor, sitting room and dining room), all tastefully appointed with oriental rugs and period furniture. Upstairs, four comfortable guest rooms display treasured family quilts and lace curtains, providing king or queen beds and private or shared baths. Special comforts for our guests include a piano, 6' claw tub, cable T/V, A/C, and phones (with private line for guests). On site parking. Breakfasts are generous, prepared with great detail each morning. Some favorites are Stoltz House Strada and Peach Melba Parfait with home-made granola, muffins and juice, coffee or tea. Located just minutes from interstate 90 Marianna Stoltz House provides the privacy or the hospitality that creates the perfect escape for vacationers, honeymooners or traveling professionals. 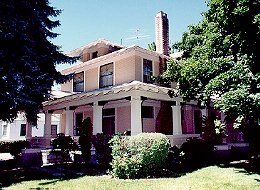 This and other Spokane Bed and Breakfast Inns can be found here in The Register.